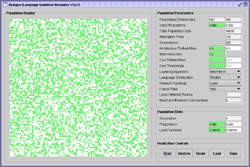 ALingua is a Java application that simulates the evolution of a two-language system in a finite population. In particular, it allows one to examine the spatial dynamics of such a system given a set of initial conditions: a distribution of agents, a network defining connections between them, and a language learning algorithm with associated parameter settings. Pragmatically, comparisons between the outcome of simulations and empirical results from historical linguistics will facilitate the search for satisfactory theories of diachronic language change. You can also download the application as a JAR package here. In order to use the ALingua software you must have the Java Runtime Environment (JRE) installed on your machine. You can download the appropriate software for your platform here. A copy of the Master's thesis I've written based on ALingua simulations can be downloaded here in either PDF (968 KB) or Post Script (3.95 MB) format.